Product information "Rust look set "Outdoor Extreme" (2 x 100 ml + 150 ml)"
The rust effect set "Outdoor Extreme" contains additional 150 ml of cellulose spray to seal your rust patina surfaces for weather resistence. The rust effect paint allows you to create artificial and impressive rust effects on any kind of surface. In order to create the weather-resistent rust look by yourself, you only have to apply the 3 components of this set on wood, concrete or other non-ferruginous material. First you apply component 1, the rust patina primer and then you spray on component 2, the rust activator (accelerates the rust creation on the priming). The "used look" created by the rust effect colour is en vogue, not only in fashion and music instruments, but also for interior design. Furniture, doors as well as decorative objects can be provided with artificial rust. The rust look with its warm shades of red of a real rust layer can be created by yourself on any non-metallic object within seconds. The rust effect paint is used in interior design for "habby chic", in industrial style to steam punk projects. By using the Tifoo Rust effect paint, you can make real works of art out of numerous objects. The effect of artificially aged iron can create some very interesting aspects even in living rooms. 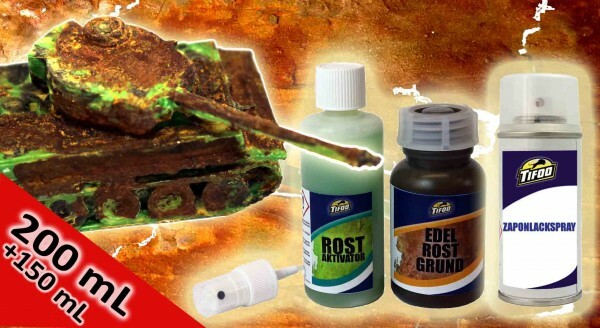 Do your own rust look - with the Tifoo Rust effect paint! 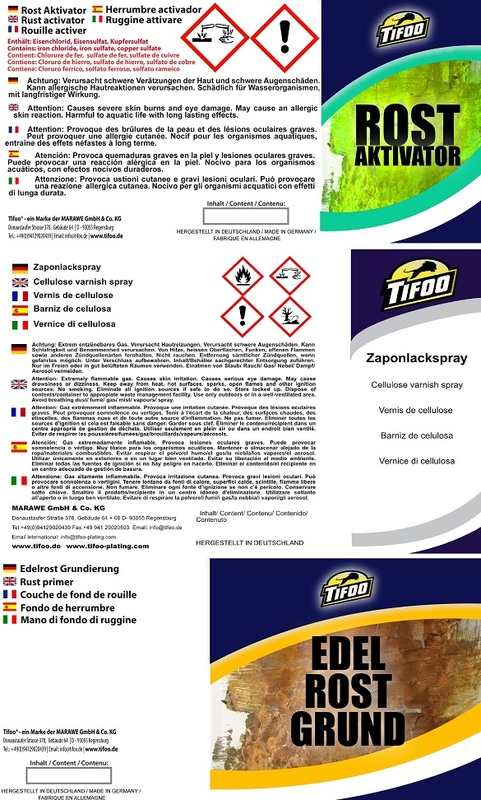 Related links to "Rust look set "Outdoor Extreme" (2 x 100 ml + 150 ml)"
Instruction manual for Tifoo Rust look set "Outdoor Extreme" (2 x 100 ml + 150 ml) as PDF file. Customer evaluation for "Rust look set "Outdoor Extreme" (2 x 100 ml + 150 ml)"